There were many different avenues I could have gone as far as a name for this post goes, but I think what I ultimately chose is most appropriate. I mean scallop trim, leopard print, distressed white demin, and hot pink heels... what more could a girl ask for? All four of these pieces are quite literally some of my favorite styles, and they came together perfectly in this look. I can say with quite certainty that this is indeed a 'Gretchen outfit' from top to bottom - ask anyone that knows me well, I'm sure they will agree! Each and every piece in this look, is one that I absolutely adore on its own. The J.Crew silk racerbacks have always been a go-to of mine for an easy night out look, but the scallop trim detail on this top just very quickly became a new favorite. It's amazing how such a small detail becomes such a game changer! White denim is another serious staple of mine - I honestly live in white jeans come the warmer months. Full disclosure, they can be a little bit high maintenance as I'm sure you can imagine, but are absolutely worth the risk! I got this pair of Frame skinny crops in the Shopbop sale, and they are amazing. I honestly don't think I've ever loved a pair of denim as much as I love these. The fit couldn't be more perfect, they are so incredibly comfortable, and the details are on point. The raw undone hems and destroyed knees have me swooning. This was my first pair of Frame denim and I already want another pair - very very impressed! 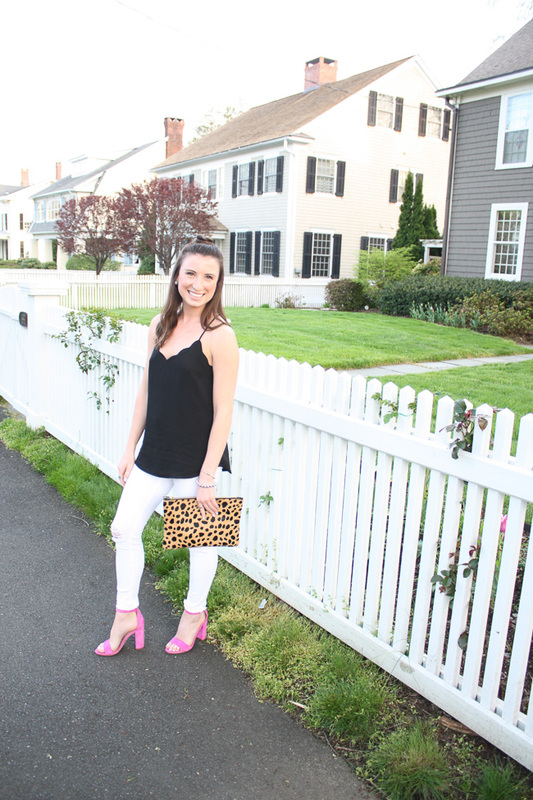 And now for the fun part of this look - the leopard clutch and hot pink block heel! They both add the perfect pop to this outfit and in my opinion they make the look. Without them it just wouldn't feel complete. 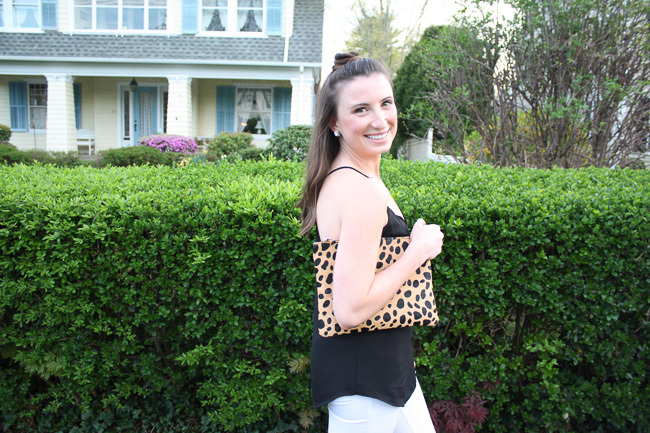 I debuted the leopard clutch in this post and I love it just as much now as I did then. Despite it's bold print, it seriously goes with everything. I'm telling you, leopard is really a neutral! The shoes have also already made an appearance on the blog, but here they are stealing the show. I think if I had to pick my favorite part of this look, the shoes would be the winner. Just perfect and so fun. I have a feeling that this is not the last time you will be seeing either of these items. I can't wait to keep styling them - definitely stay tuned for more! 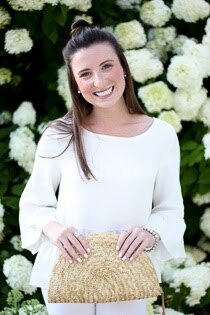 As always, I have linked all the pieces below in case you want to do a little browsing and shopping! I'm telling you, all four of these pieces are ones that you need in your closet. They so easily come together and complement each other in this look, but can also all be styled so many other different ways. You just can't go wrong! Check them out below and enjoy!